Bobbie Roehm has worked in fashion and retail for over 20 years. So when she decided to open a new store in Montpelier, she understood the importance of the planning process. Right away she enlisted the help of Charley Ininger, an advisor for the Vermont Small Business Development Center (VtSBDC). Together, they stepped through the process of writing a business plan and applying for financing. Roam opened its doors in the spring of 2018. The retail shop, located in the former Shoe Horn store on Langdon Street in downtown Montpelier, sells outdoor-lifestyle footwear and apparel. 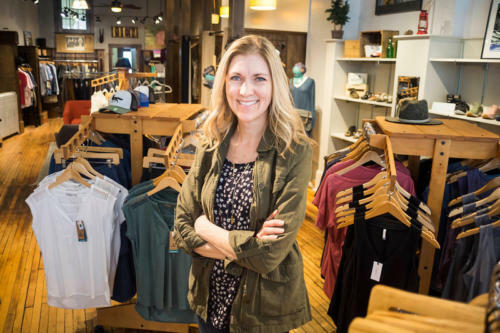 Owner Bobbie Roehm had been a footwear and apparel buyer for the Shoe Horn, and when the store closed, she decided to take it over. In today’s online shopping world, local support is key to a successful retail operation. Roehm enjoys being in the center of the capital city’s business district. “We have a tight-knit community that is really cognizant of the importance of supporting local businesses,” she said. She has developed strong relationships with her fellow retailers and regular customers. “Our customers tell us they enjoy the store and are so happy we are open,” Roehm said. “This inspires us to do the best job we can for them.” She and her staff help customers make informed purchasing decisions, while learning more about their buying preferences to improve product offerings.